Unframed stretched canvas. Image of a compartment full of people with bags. The colors are yellow, black and red. Signed in caps, LL: Hisako Hibi / Sept 1942 ; (Back) A Happy Day to go outside the Camp Delta--a nearest town when the restriction was eased and we were allowed to go out in an army truck but The permission was one person from one block once a week "Shopping to Delta" in an army truck wish to be free to free to liberate body and spirit-- but an army truck No sight seeing because the truck was fully covered. A covered wagon truck! Delta was the nearest town to the Topaz Concentration Camp. Camp administrators eventually allowed internees restricted access to Delta in order to go shopping. A pass was issued to one person from each block per week, thus, internees had to negotiate amongst themselves who would be able to take advantage of this unique privilege. These opportunities were special for a number of reasons. First, the evacuation orders restricted Japanese Americans from taking most of their belongings. All they could take with them into camp was what they could carry, limiting what they could take to the bare essentials. In addition, the majority of the internees at Topaz were from the bay area and were unaware that they would need to be prepared for the harsh weather conditions of the Utah desert. There was a camp store but there was little variety in the items available and its supply was unreliable. The trips also allowed internees some exposure, though limited, to the world outside of camp. Thus, these shopping excursions were valued highly by many internees. The internees were transported in a US army truck on these trips. 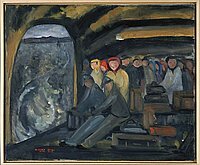 Hibi offers a depiction of the inside of the truck with several Japanese Americans huddled on one end, while two men appear to be arranging some of the boxes filled with goods. According to Hibi's inscription on the back of the painting the truck itself was covered so that no one could see in and the passengers could not see out. 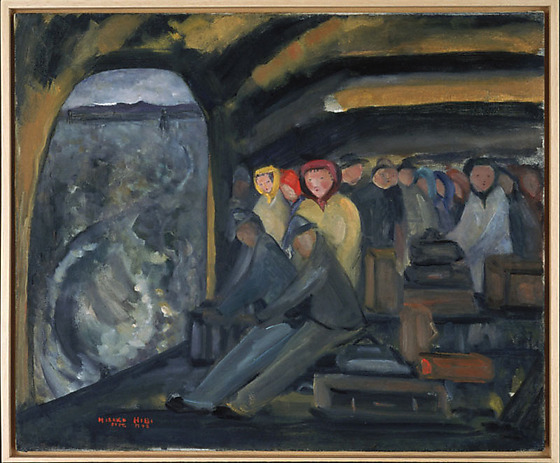 In her painting, however, Hibi ignores proper perspective in her composition in order to show the camp barracks and guard towers in the distance through the back opening of the truck. Therefore, Hibi insists on situating her work within the context of her camp experience.